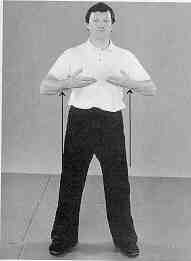 Chi kung is an ancient form of Chinese yoga. 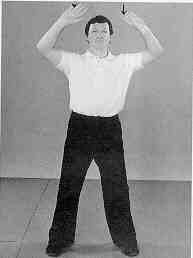 Chi Kung training benefits the health. 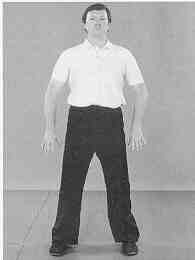 Stand relaxed, spine straight, head up, with your feet parallel and one shoulder width apart. Your hands hang by the sides. As you breathe in, slowly lift your hands in front of you, wrists uppermost and fingers hanging down. By the time you have completed your in breath, your hands should be in line with your shoulders. Move your hands as if pressing down on something, breathing out as you do so. Your hands should end up by your sides. Repetitions: start with four and slowly work up to ten. 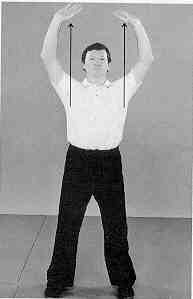 (Holding up the sky) From the starting position, lift your hands, palms up, to chest height as you breathe in. Turn your palms up and slowly push upwards as you are breathing out. With your palms still pointing up, slowly move them down to face level as you are breathing in. Turn your hands over so that your palms face down. As you are breathing out, press your palms down. Repetition: as in exercise 1. 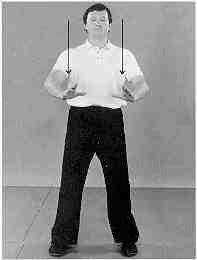 (Separate the hands) Slowly lift your hands with your palms facing each other, as if you are holding a ball, your left palm on top, your right underneath, breathing in as you do. Slowly push your left palm up and your right palm down in a straight line, as if you are pushing against something, breathing out as you do so. 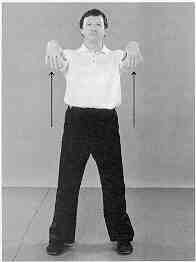 Slowly return your hands to the hold-the-ball position, breathing in as you do so. 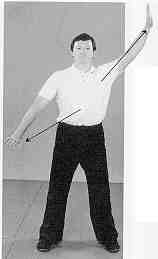 Slowly push your right palm up and your left palm directly down, breathing out. Move your hands back to the hold-the-ball position, breathing in. 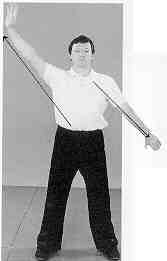 (Separate the hands diagonally) Move your hands up to the hold-the-ball position, breathing in. Slowly push your left palm diagonally up to the left and your right palm diagonally down to the right, breathing out. Return your hands to the hold- the-ball position, breathing in. Slowly push your right palm diagonally up to the right and your left palm diagonally down to the left, breathing out. You have now completed one repetition. Repetitions: as in exercise 1. 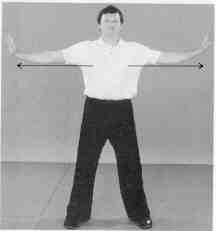 (Pushing out to the sides) Slowly lift your hands, palms up, to chest height, breathing in. Turn your palms out and slowly push to the sides, breathing out. 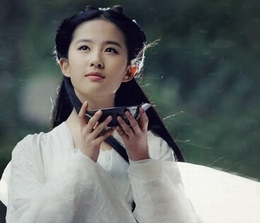 Return your hands to in front of the clest as before, breathing. Turn your palms over and slowly press your hands down, breathing out. You have now completed one repetition. Repetitions: as in exercise 1. (Pushing to the front) Slowly lift your hands, palms up, to chest height, breathing in. Slowly push your palms forwards, breathing out. Slowly return your hands to in front of your chest, breathing in. Slowly press your hands down, breathing out. You have now completed one repetition.Repetitions: as in exercise 1.
perfectly clearly explained and great, the images are very good too. the best. clear and concise.